Innovation Lab is a space destined to optimize innovation in a company by setting up a creative, collaborative environment where new knowledge is exchanged and ideas are developed. A space destined to optimize innovation in a company by setting up a creative, collaborative environment where new knowledge is exchanged and ideas are developed. Having a space designated for innovation can also bring gains to company culture and internal communications, since it is a hub that will be disseminating the knowledge acquired from each project and thus spreading innovation culture. Before getting into technicalities, we must ponder one thing: if the lab will be built for people, what do human beings need it to be like? What will bring the best out of their work performance? Each lab should be designed to meet the needs of each company and its heterogeneous body of employees, and an in-depth study should be done to understand those needs. We are social creatures moved by engagement, be it during work or outside of it. There are tremendous psychological gains that come from working together, feeling resourceful and making a change. - It must be spacious, open and strategically located so that a considerable volume of people can interact with the lab and also see and be part of what’s happening inside. - It must stimulate creativity by having movable and colorful furniture, which creates a sense of dynamism and adaptability to different contexts. - There should be whiteboards and open walls to facilitate the sharing of ideas, as well as inspiring decoration such as quotes and technological concepts. - The lab must have technology available to allow real-time exchange with remote workers or other offices, which will speed up decision-making. In times of a growing demand for innovation due to a saturated market with overflowing competition, an innovation lab is an investment that has the potential to bring many internal and external benefits to your company. 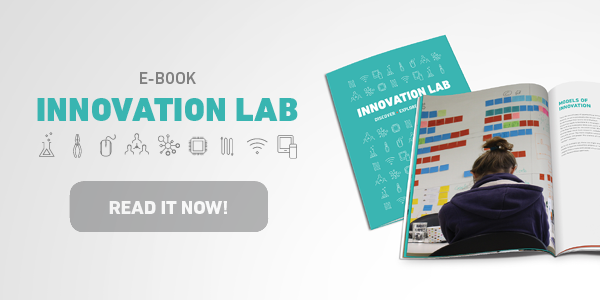 To learn more about Innovation Labs and how they promote a huge impact in disseminating corporate innovation culture, read our new e-book.